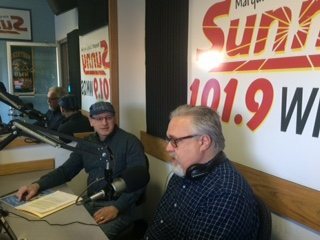 I heard Walt and Mike this morning speaking with Dave Stensaas Rockwood about the Brits and Brews Fundraiser for JJ Packs this morning and was both entertained and inspired. Dave has worked hard to bring top notch bands in from here and out of state for the benefit of local kids in need. We can all enjoy a variety of musicians while giving back to our community! Too many young people are trying to survive the daily needs of life with little or no food….. This is our chance to help the kids we know…and don’t know about. Walt Lindala will MC the event, and may even pick up a guitar! We’ll find out for sure during the night! Dave deserves our thanks for his efforts. JJ Packs is where it’s at and this is the kind of event that feels good for everyone!!! Great music and while collectively taking care of our kids! Brits and Brews Saturday April 28, from 5:30 til closing at the Ore Dock Brewing Co. 114 spring St. Marquette. It’s going be a groovy happening baby!